A Guardian op-ed by David Zonsheine, board chairman of B’Tselem, charged Israel with engaging in a “barbaric” act against Bedouin in Khan al-Ahmar, an encampment in the contested E-1 area between Jerusalem and Ma’ale Adumim – within (Israeli controlled) Area C of the West Bank. Israel is intent on destroying the homes of the 173 Palestinians who live in the small shepherding community of Khan al-Ahmar, along with the school that serves 150 children from the area. Last month, Israel’s high court of justice removed the last obstacle to this barbaric act of demolishing an entire community in order to forcibly transfer its residents and take over their land. We’ve highlighted the words “their land” because it erroneously suggests that the Palestinians own the land in question. However, as is made clear elsewhere in the article – and, as CAMERA demonstrated in a recent post on the dispute – nobody, not even the NGOs advocating on their behalf, claim that it is legally “their” land. So, in what sense can the eviction of people living in illegal and unauthorized communities – be they in the Bedouin encampment of Khan al-Ahmar (built and sustained with the help of foreign NGOs) or the recently evacuated Israeli community of Netiv Ha’avot – be considered “barbaric”? These residents are not breaking the law deliberately. Israeli policy has prevented them from even applying for building permits. This has left them no choice but to build without permits and, as no community remains stagnant, they have had to continue developing and building that way. However, the Bedouin of Khan al-Ahma, and the NGOs representing them, have refused offers by Israeli authorities to relocate them to land, in the Jahalin HaVatikah neighborhood of nearby Abu Dis, suitable for their nomadic lifestyle. Naomi Kahn, director of the International Division of Regavim, detailed the government offer in a recent article at JNS. The government…set aside state land for a new neighborhood on the outskirts of Abu Dis, named “Jahalin West,” and offered a package worth over half a million shekels for each wife in each of the Jahalin households—a package that includes a large plot of land, completely developed and zoned for residential construction, with infrastructure for water and electricity. The new neighborhood will offer services…including health clinics, public transportation, proper schools, access to employment and more. Zonshein then characterises the government decision, backed by the supreme court, to evict the Bedouin as an “act that could constitute a war crime” without even attempting to back up his allegation. Moreover, the demolition of Khan al-Ahmar will have significant repercussions for possible solutions to the Israeli-Palestinian conflict: clearing the area from Palestinians will effectively bisect the West Bank from north to south. The claim that clearing Palestinians from the E-1 area, and building Israeli communities in that area, between Ma’ale Adumim and Jerusalem, will bisect (cut in half) north West Bank from south West Bank, making a contiguous state impossible, is a frequent and false claim. As CAMERA has demonstrated, even if Israel were to annex all of E1, “approximately 15 kilometers remain east of E1, enabling north-south passage and ensuring contiguity for a future Palestinian state”. Since Zonsheine wants Britain to “step in”, let’s see how Britain deals with squatters. I think their laws may be useful. Anyone who originally enters a property with the permission of the landlord is not a squatter. For example, if you’re renting a property and fall behind with rent payments you’re not squatting if you continue to live there. Although squatting in non-residential building or land isn’t in itself a crime, it’s a crime to damage the property. You can remove squatters using an interim possession order (IPO) or making a claim for possession. Don’t try to remove the squatters yourself using force or the threat of force – you’re committing a crime if you do. Get legal advice from a solicitor if you need help making a claim for possession. You can only apply for an IPO if it’s been 28 days or less since you found out your property’s been squatted. Fill in an application for an IPO and send it to your local county court. The court will send you confirmation of your IPO within a few days. They will also send you documents that you must give to the squatters within 48 hours. To get final possession of the property, you must make a claim for possession. You can do this on your IPO application form or separately online. 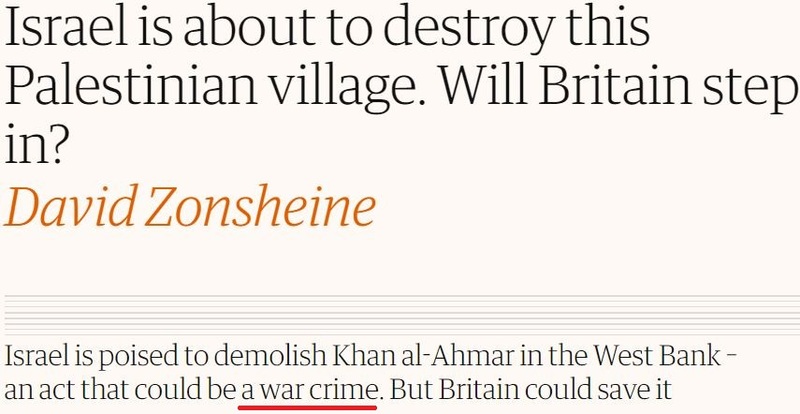 A “war crime?” I wasn’t aware that Israel was at war with the Bedouins who live there. For war propaganda purposes they are now ‘palestinians’. It’s logically what follows when the people you support which you claim are ‘indigenous’ have a borrowed name. Why not just add on some others?